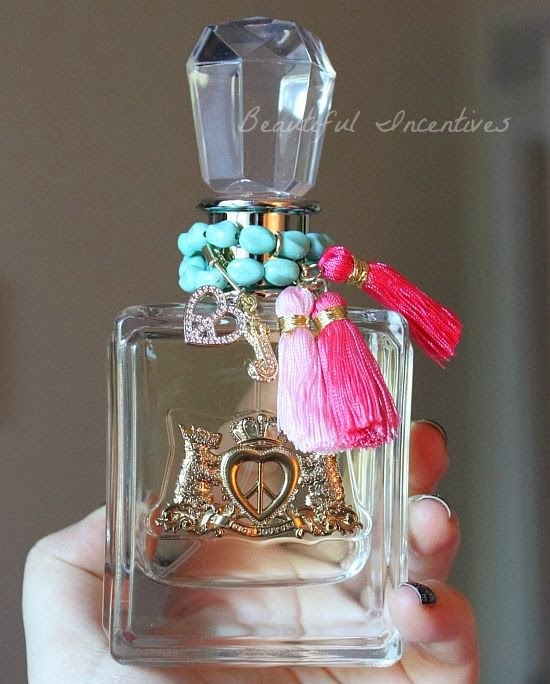 Beautiful Incentives: Peace, Love & #JuicyCouture Perfume Review & #Giveaway! 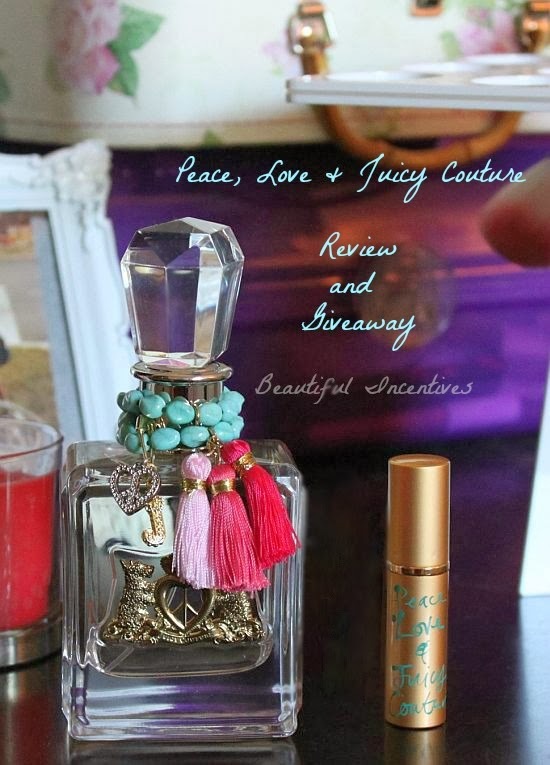 Peace, Love & #JuicyCouture Perfume Review & #Giveaway! I am ecstatic to be able to offer one lucky winner this beautiful perfume! I have to thank the many bloggers who helped promote this giveaway. I haven't been able to try many top of the line perfumes in my life time, but when I get the chance, it is like early Christmas to me. Especially when they come in absolutely gorgeous bottles that I can display on my dresser like they are prized works of art. Juicy Couture is known for their sweet, yummy and girly scents that I adore, but today I am here to introduce a new twist they came up with. A scent that is reminiscent of the hippy days with strong notes of earthy tones and musks. I was not even aware that when I read the description this is what I would be getting. I have smelled earthy and sweet hippy scents before, but this is definitely not sweet. I do prefer the tried and true sweeter scents that Juicy is known for, but this scent is definitely something that will appeal to the many that do not care for those. I actually like to sniff it not on myself, but on things around my place. I found that it's nice to walk into my closet and get a whiff of there or on my bed, but it is not something that I would wear on myself. I would actually funnily enough, love to smell it on a man though! I think this scent is very versatile and would work for a man or woman. I do love that almost grassy after smell that if I were walking outside it would be pleasant to come across. I think it's a scent you have to be in the mood for. As the name suggests, it is filled with a lot of the hippy scents some of you know and love. It's definitely not night time or date wear, in my opinion. It is a light and airy day wear that is perfect for the beach or luncheon with friends. It is very fresh and inviting though. This is how the company describes the scent. Honestly, I don't detect any of the sweet top notes once it is on my skin. At first spray, there are hints, but those fade fast. Everyone's skin chemistry is different, but musky scents tend to be just that on any skin type. So what you are getting is a very earthy, floral and musky scent in the end. Overall, this fragrance will definitely be useful and I may end up giving it to someone who prefers more musk or just keep spraying it all over everything but myself. I will have to switch out the bottle though, because that is going nowhere, but in my collection. I will say that i'm proud of this line for stepping out of the boundaries and trying something brave and new. That I love. As for what holds the perfume, the bottle alone is a work of art. I have always had a thing for glass, even if it's just a perfume bottle. Though I don't see it that way. The small but powerful and colorful additions are what make this bottle special. I wish Juicy Couture would add that kind flair to all their editions! If you want to grab it now for an amazingly DEEPLY discounted price, you can do so here! I highly suggest you follow Beauty and Home Decor on their social media to keep up with promotions and new products that come in all the time. They sell a variety of discounted beautiful home decor makeup and more! And now for the giveaway! One lucky winner will receive both the 3.4 ounce (100 ml) bottle of Peace, Love & Juicy Couture pictured below + bonus travel spray you see pictured above. Over an $89 retail value! I would put a new rug in my livingroom. The question is asking where i would put the rug,so i reckon and hope its ok & dont disqualify me. Ive never got to try many top of the line brands perfume either and would love to win the Juicy couture perfume..I know it has to smell amazing! I love juicy contour. It is yummy. Thanks for the chance. It all depends on my mood, but I usually go for either floral, fruit or woodsy. I've always been a fan of musk scents since high school! I like floral scents usually but I also love oils like sandalwood and patchouli! I like the smell of baked goods. I'm all over the place with scents. If it smells good I like it! I usually love sweet fruity and floral scents the best! I prefer lighter scents such as something floral with a hint of musk. I love juicy contour, I have only had a sample before. I love anything that is fruity or feminine. I love scents that are heavy on woods and spices.